New Delhi: State-run Bharat Heavy Electricals Ltd (Bhel) may form an equal joint venture with Indian Railways to set up a factory at Kanchrapara-Halisahar railway complex in West Bengal with an annual capacity of 500 coaches for electrically powered trains. While the move will help Bhel diversify its portfolio of offerings, it will also enable the railways to achieve its objective of partnering with the corporate sector to manufacture coaches and engines. The land for the factory is to be made available by the railways. The decision to set up the factory through the joint venture or public-private partnership mode was announced by Mamata Banerjee in her railway budget speech and will require an investment of around Rs300 crore. A railway ministry official who did not want to be identified confirmed that the ministry had received a communication from Bhel and the ministry of heavy industries, the company’s overseeing ministry. The official, however, said the project hadn’t got cabinet approval yet and that when it does, Indian Railways would select its joint venture partner through international competitive bidding. Bhel’s proposal comes after an expert committee set up to suggest funding patterns for rail projects recommended that the railways seek bids for proposed diesel and electric locomotive component factories from private firms and forge a joint venture as reported by Mint on 21 September. The railways constitutes an indispensable part of India’s logistics infrastructure, transporting at least 40% of the country’s land freight traffic and 20% of domestic land passenger traffic. It is the world’s fourth largest freight carrier, transporting at least 2 million tonnes of freight daily. Bhel is looking at sectors such as the railways for orders as it fears that its domestic market share may decline to 50% from the current 60% in five years due to increasing competition from local and foreign firms. “Both railways and defence offer a captive market to Bhel. 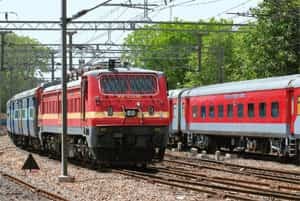 Even Indian Railways will feel more comfortable in forming a company with Bhel rather than going with the private sector," said Gokul Chaudhri, partner at audit and consulting firm BMR Advisors. A Planning Commission official, however, said on condition of anonymity that the railways should go in for competitive bidding for the project rather than a joint venture. “If Bhel can compete with Bombardier or Siemens, let them compete," said the official, adding that competitive bidding would result in better price discovery. Bhel posted a net profit of Rs3,039 crore on revenue of Rs27,505 crore in the fiscal ended 31 March. It aims to be a $10 billion (Rs46,600 crore)-plus firm by revenue by 2012.